This woman is not one of my ancestors, but she is a relative. She is my Great Great Aunt. And, she figures in family history. This is Maria de Jesus (Jacinto) de Braga, aka Mary DeBraga. I chose this photograph because it is one of the very few I have from ca 1910 with women in their “natural setting” (not posed). The family was out for the day at Carmel, I believe, searching for clams. I can’t help but be drawn to Maria’s smile. It is infectious. I also can’t help but wonder how she got around on the beach in all that clothing! 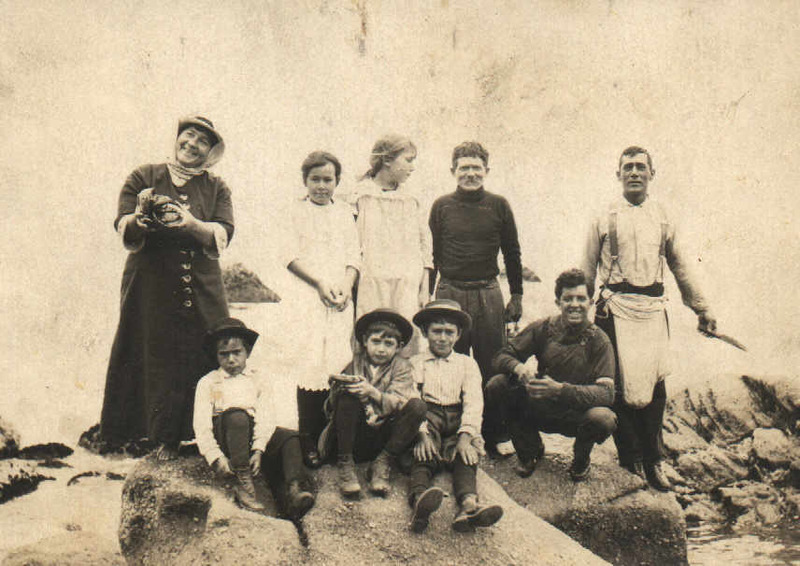 Maria was born in 1876 in Arrifes on Sao Miguel Island. She migrated with her parents to Hawaii in 1883 on the S.S. Hankow. She was 7 years old. Her family worked at the Koloa Sugar Plantation at first. Then when their contract was up, they moved over to the Kilauea Sugar Plantation. This is where she met Jose de Braga, my Great Grandmother’s brother. She married Jose de Braga were married in Kilauea in May of 1895. Maria was 19 and Jose was 21. They lived on the Kilauea Sugar Plantation. Maria and Jose set out to start a family, but it was not to be. Maria could not have children. So, this kindly woman did her best to help the women with children in the family. And then, a tragic twist of fate would make them parents. My Great Great Uncle, Joao Pacheco, became very ill with emphysema. When he died in 1906, he left his widow, Joana (Gonsalves Cardozo) Pacheco, six months pregnant and with seven children. Joana had no way to feed all her children. She probably worked on the plantation or took in laundry. The older children probably worked in the fields catching rodents or doing small tasks. Rather than see her children starve, Joana gave some of them away to childless family members. One of those couples was Maria and Jose. They were given Joana’s 3 year old daughter, Isabella. Maria and Jose left Hawaii within the next year. They brought Isabella with them and raised her as her own. It wasn’t until Isabella was married that she found out her Pacheco friends were really her siblings. Those times were so different. There was no legal paperwork. People solved their problems within the family. Joana’s tragedy became Maria’s greatest gift. They were very lucky to have each other. Click to see the whole photograph. What a wonderful photo! She looks like she was a fun lady!